The sun is shining, Spring is here and we have the sweetest selection of Hermès handbags in all different shades of pink and we have to admit, they look almost good enough to eat! A vibrant pop of pink is a wonderful way to breathe new life into your Spring Summer wardrobe and here at Lilac Blue London we have an array of styles in the most compact sizes, for moments when you only want to take a few essentials out with you and travel light. In the prettiest dusky soft pink, the distinctive Hermes Medor Clutch Rose Sakura Tadelakt PHW is a great choice for someone who likes to dress in feminine styles with a slight edge. This style fits beautifully and comfortably in the hand but can also be carried under the arm and the statement Collier de Chien hardware also allows the bag to be made smaller or wider as necessary. In Tadelakt leather with Palladium Hardware, the full measurements of this style are: 23cm x 11cm x 5cm with a T stamp and 3Q colour code. How amazing is the colour of the Magnolia Jige Elan in Swift? The Hermès Jige Clutch has been a firm favourite of Hermès for a long time but this simple and chic design never loses its appeal. This envelope style clutch bag makes an ideal evening bag and is a new colourway that was introduced in Autumn 2018. This C Stamp style in Swift leather with a 9l Colour code is a real beauty and will look amazing for daytime wear or a special occasion. The measurements of this style are 29cm x 15cm x 3cm. The 20cm Mini Kelly style is already a hugely desirable little bag but we absolutely love this style in the Rose Pourpre, a vibrant pink with purple undertones, which is a new colour from Spring 2018. Bigger than the Kelly Micro but smaller than the classic Kelly but still with enough room to fit in a few essentials such as a lipstick, smart phone and keys. With stunning Chevre leather and Palladium Hardware, this is such a striking bag and will see you through the warmer months year after year! Full measurements are: 20cm x 14cm x 9cm, the colour code is L3 and this style is a C stamp. Hermès has so many pinks to choose from but Rose Azalee is one of our favourites as it’s bright but not overpowering and is a very refreshing shade for Spring and Summer. Featuring gold hardware and a 8W Colour Code, this C Stamp Kelly Mini Pochette will be a stylish addition to your outfit for weddings, the races, weekends and everything in between! The dimensions of this style are 22cm x 14cm x 7cm. Last but by no means least is this gorgeous Kelly Wallet in a pinky coral red Rose Jaipur shade that is guaranteed to stand out from the crowd. In the perfect size, this classic Epsom leather wallet has the is also very light and scratch proof. The colour code is T5 and the measurements when closed are 19.7 x 11.5cm. The wallet comes with the original receipt and all accessories including the box and dustbag. If you would like to book an appointment at our London showroom to view the latest pink styles by Hermès or any other styles from the Lilac Blue London collection, please call on +44 845 224 8876 or email info@lilacblue.com for more information. 2018 saw the largest shift in accessories fashion that we have seen this decade. Small handbags became a massive hit. The fad has become a part of mainstream fashion, and now we are witnessing a return to large practical pieces. The trend for small handbags reached a peak in 2018, with Hermes' introduction of the Mini Kelly taking the world of high fashion by storm. Not to be confused with the Kelly pochette clutch, the Mini Kelly is a 19cm miniature handbag, with a single handle, and a shoulder strap which is long enough to cross-body. The bag was initially available in box calf leather, with a short shoulder strap, in the 1980's. 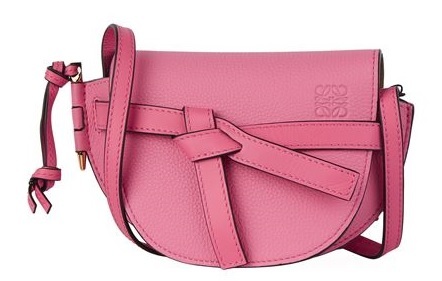 Of all the tiny bags on the market, apart from the classic dimensions and exquisite craftsmanship of the Hermes bags, I love the new Loewe Mini Gate bag: it's suitably tiny (just 15cm) and available in a range of colours including this lovely baby pink. It's far from practical: not only is it too small to hold my iPhone 8 plus with my wallet, but hey, if you have someone to carry money for you, don't need a giant phone and are too beautiful to need make up, it's perfect. Available from www.loewe.com Another new trend - or perhaps should I say fad - that appeared in 2018 was the return of the bum bag. 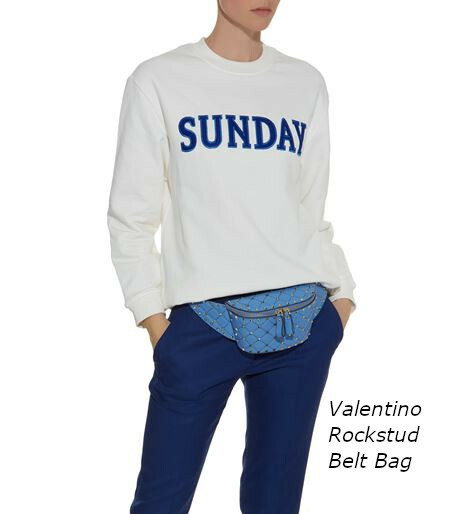 Equally unfortunately named fanny pack in the US, I have decided that if I had to wear one of these, this would be the Valentino Rockstud Spike Leather Belt Bat. 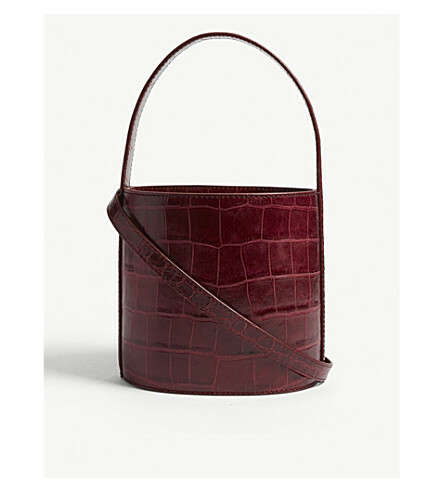 Available at www.harrods.com What will happen to bag sizes in 2019? It took most of the year to learn how to squeeze my wordly belongings into a 30cm Birkin instead of the usual spacious 35cm bag, and now that I have mastered that skill, I can comfortably report that I would still rather carry a large handbag! The first appearance on the scene has been the bucket bag. This one by Staud works well if you left your ice bucket at home. Available at www.selfridges.com. Not quite my thing. We are now seeing an increased number of requests for Birkin 35s: the bag that has been the most sought-after accessory in fashion history. The fact that the Far East auctions are approximately double those in London are an accurate reflection of the market: there are more Hermes shops in Japan than in any other country, and the quest for the ultimate handbag may be fiercer in the Far East than anywhere else. There are also more super high net worth individuals in the Far East who collect art and precious artefacts than in Europe. What we do not see here is a US presence: this is because there are several auction houses in the US, including Christies and Heritage Auctions who run regular handbag auctions. New Line for Lilac Blue London. 2018 is our 10-year handbag anniversary! We sold our first Hermès bag in 2008. And we've now been in Mayfair for 8 years. Llora handbags is a Singaporean brand creating exquisite crocodile handbags and clutches. The craftsmanship is just beautiful, the designs exciting and elegant. The brand has a core following in the Far East, opened in the United States in October, and comes to London in March. 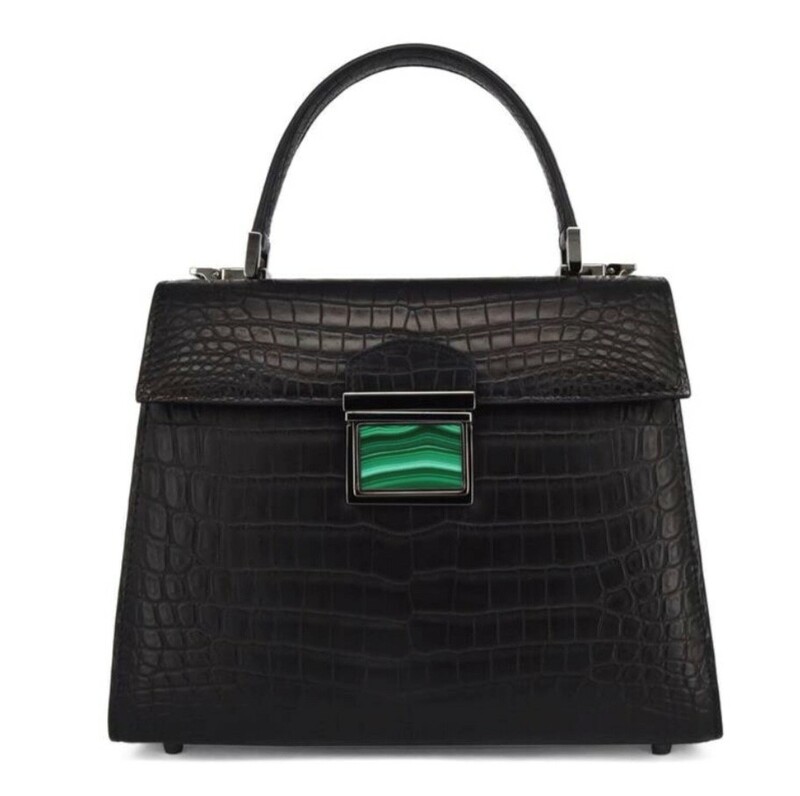 Here is a preview of the Sam in matte black crocodile with malachite stone which will be retailing at approximately £10,000. It's that time of year again: when Hermès has all the resellers and key clients guessing as to what date stamp they are going to put on the bags. It used to be a matter of a simple alphabetical listing from A to Z. But 5 years ago they started missing letters, in order to dupe those naughty people making bad bags. This week the first new date stamps have been released and we can report they are C stamp. 2017 was A stamp; 2018 is now C stamp. There is no B stamp! If you have a problem finding your stamp, be aware that it moved 3 years ago from behind the metal part of the strap to the top right inside corner. And if you do get confused , do not worry: most people have been confused by this! We sold our first Hermès handbag in 2008. Since then the most popular bag we have sold, by far, is the calf leather Birkin 35cm. So we thought this the natural place to start our new series of reviews. And to add a little spice, the bag we have chosen will be appearing in the new movie 'Dirty Rotten Scoundrels' next winter, on the arm of the beautiful Anne Hathaway. Here it is in Mallorca where they filmed on location. The colour is the true Hermès gold, a dark rich tan and a classic colour which is increasingly hard to find as Hermès releases more and more shades, each for one season only. We bought this bag from a British businessman, and examined it in the dimly lit Starbucks on Holland Park in West London - these were the innocent days before our Mayfair showroom. I accepted his word that it was brand spanking new, but once we had bought it and found the date stamp it was clear the bag was already 3 years old. Oh the silly novices that we were! It had not, however been worn and was the first non-brand-new bag we bought. So a great piece with which to start our reviews. 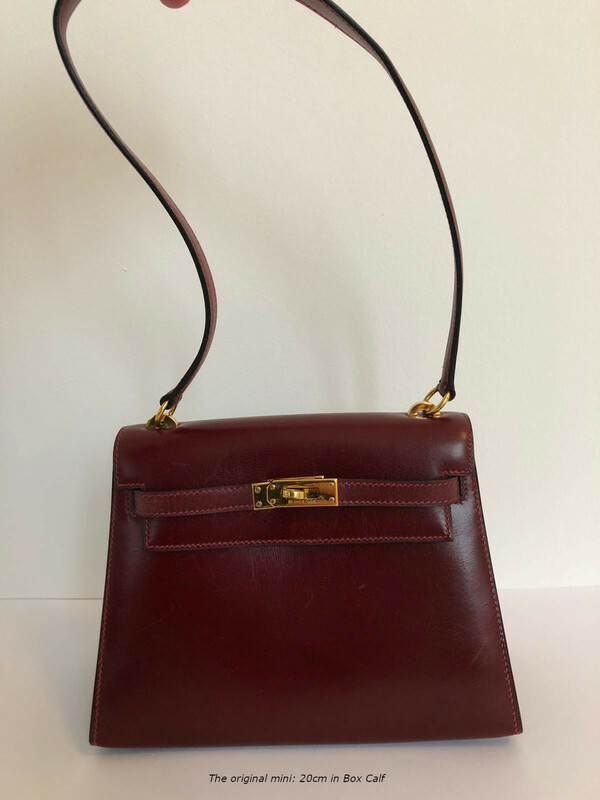 It has become one of my favourite Birkins: because the colour has been so well applied it seems the leather was born this rich dark shade, and because of the deep marks in the 'legs' running through the leather which makes the bag utterly unique. Beyond that however, is my deep respect for the craftsman who made it: I have spent more than 10 years professionally examining the world's most beautiful and expensive handbags. This bag is the most resilient calf leather piece I have ever tried. It does not try to be anything remarkable, but it is a trusty and reliable companion. On the outside, the Birkin is highly structured and quite boxy. The two handles are well proportioned and will allow you to carry the bag on the forearm and immediately add a certain elegance to your gait. There are two leather straps, finished in metal, which gather the leather and close over the lock in the centre of the bag. It is not however, designed to be often closed, and works well open. Because it has a flap, which partly covers the contents, it does not offer the easy access of a tote bag to passing thieves to help themselves to your possessions? The bag is made of two layers: the outer textured calf skin and an inner layer of smooth goatskin. It is therefore not always advisable to pack it full of goods as it does get heavy. We have had several customers complain of tennis elbow after years of carrying their Birkin on their forearm. Importantly, there is no shoulder strap, so you always have to have an arm available to carry the piece! This Fjord leather is even more durable than the classic Togo leather, and the bag will stand up with no sagging for many years. Sadly, it was discontinued a few years ago. The goatskin lining is soft and pliable but extremely strong. There is an inner zip pocket on one side, which always opens seamlessly. The end of the zip features a quirky metal H which people often quote as being a sign of authenticity. The other side of the interior carries a flap pocket, useful for the occasional document. The base of the bag is wide and deep, which allows you to find items with relative ease. 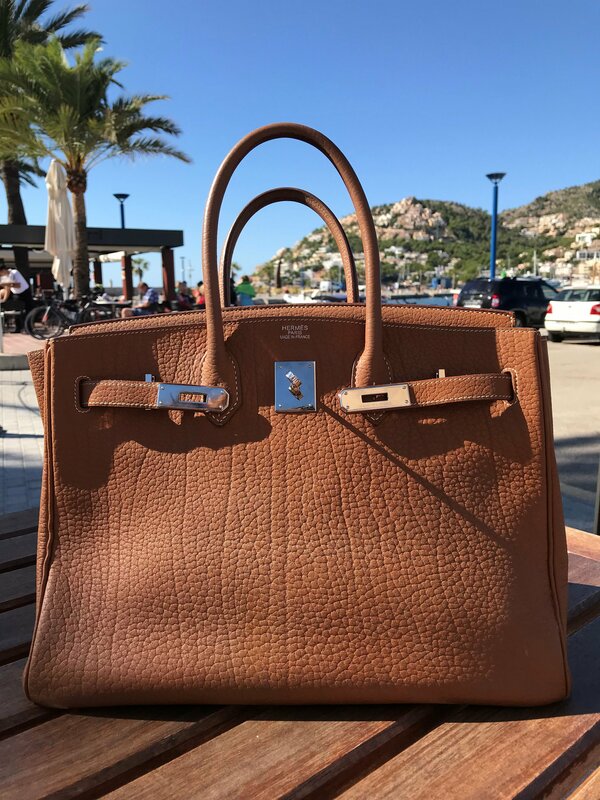 With the rise of popularity of the Hermès Birkin and Kelly, we are seeing a range of new sellers of Hermès bags, and a growing awareness of the dangers of buying inauthentic pieces. If you are in London we will authenticate for clients at no charge. We also hold private parties for clients wanting to learn a little on how to authenticate Hermès bags themselves. Let us know if you'd like to know more about them. 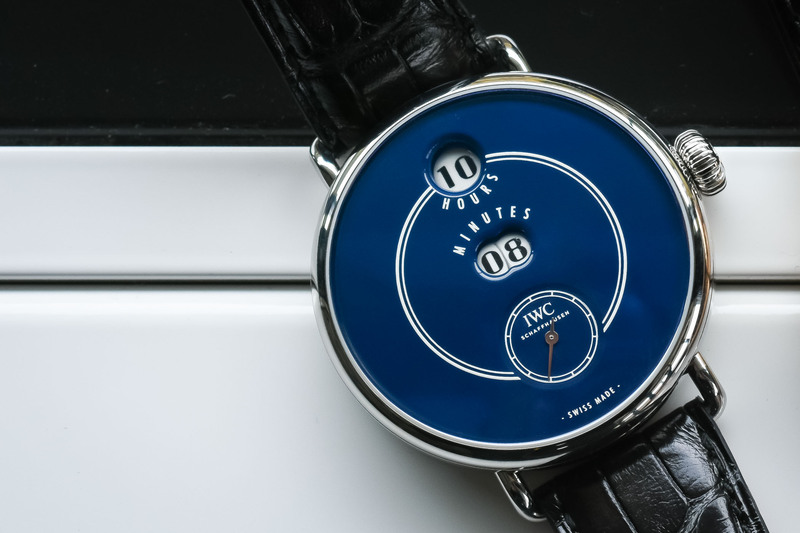 IWC made a very unusual piece in December as a tribute to the 150th Anniversary of the watchmaker Pallweber. In 1884 Josef Pallweber created a pocket watch which showed a digital display of hours and minutes. This was the first watch to show the time this way and has become a timepiece of history. The IWC homage is a wristwatch which displays the hours, minutes and seconds in the same format, fronted by a glossy lacquer that looks like the original enamel. In December IWC introduced a red and a gold model, and now in February they have launched 25 blue watches. The retail price is £55,000 and we have one at £53,000. Copyright © 2017 Lilac Blue London, All rights reserved. So winter is upon us, with bright cold days and long dark nights. London's garden squares have been quietly competing for the best firework display and bonfire. In handbag land, we have been busy organising Christmas events, the first of which will be at the new member's Club the Devonshire, on Monday 4th December. Please let us know if you'd like an invitation. 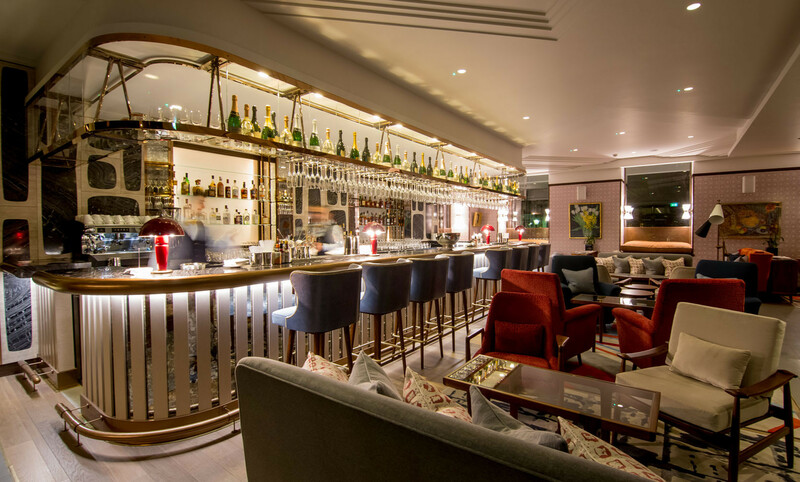 It's a chance to see this beautiful new London private club and hotel while sipping champagne and checking out our vintage Kelly collection and new Birkins. Burberry Closes Branches in the US and plans expansion across EMEA and India. 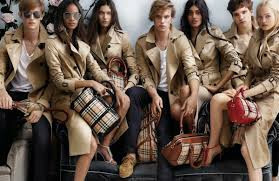 Burberry is closing down a number of stores which are not considered luxurious enough for the brand and the experience it is now offering customers; the majority in department stores in the United States. It then plans to re-energise the business and invest further in stores in Europe, the Middle East, Africa and India. Shareholders took a dim view, with the price of shares dropping by 10%, amid fears that this re-energising (as they are calling it) of the brand would mean an increase in pricing. 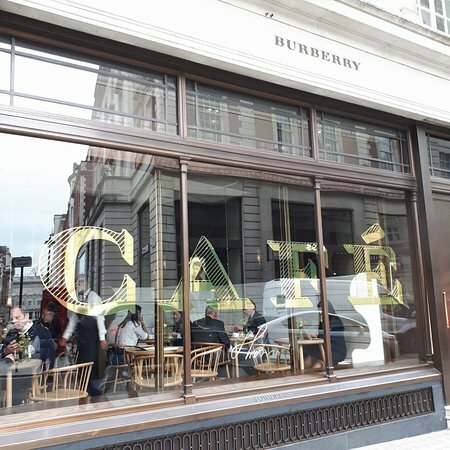 Here at Lilac Blue, sitting above the Burberry Regent Street flagship store, we have seen the attention the staff pay to customers massively improve. Going into the store here is a great experience. So while we hope Burberry will continue to be a vaguely affordable brand, we welcome the luxury experience in terms of quality and positioning however, there is still a lot of work to do on the finish of the products before the brand reaches the lofty heights of Louis Vuitton. Christie's is hosting handbag auctions in London and Paris over the next month. We viewed the lots earlier this week, and wanted to show you this amazing piece. 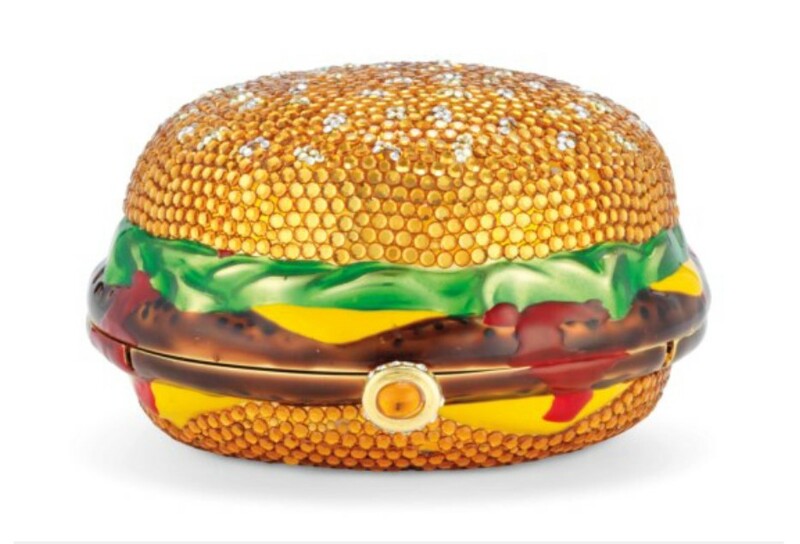 This is a Kathrine Baumann evening bag made of gold, green and red crystals. It's part of a limited edition run, number 25 out of 500 pieces, made in 1997. It's been gently used, they grade it as condition 2. It's 12cm long x 6cm deep x 12cm high. The guide price is Â£1,000 - Â£2,000. Let us know if you'd like us to bid on this or any other piece for you. "A Hermes scarf is sold, somewhere in the world, every minute of every day". So says the wonderful urban myth. Until recently, the scarves were better known than Hermes handbags. So having for years studied the meticulous designs and methods of creating the handbags, we thought it high time we looked into how the scarves are created. We'd like to thank Rice and Beans Vintage for their superb research. 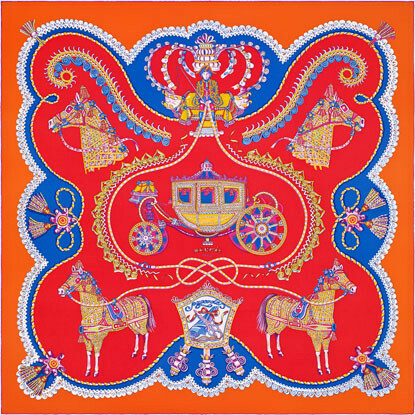 The first scarf was made in 1937, designed by Robert Dumas, a member of the Hermes family, and from then on the creations were produced completely in-house: Hermes bought the raw silk from China, spun it into yarn, wove it into fabric and screen-printed it. Nowadays, each scarf is still individually screen-printed, and the Hermes designers are able to choose from tens of thousands of colours. So while we may think Â£300 is a substantial sum for a piece of silk, bear in mind that once the design is complete, artisans in the Hermes workshops just outside Lyon take over the manufacturing process, and that takes a further 18 months. The carre de soie Hermes scarves are 90cm x 90cm square and made from the silk of the mulberry moth cocoons. Each edge is hand-rolled and hand-stitched and it is said that one seamstress will roll and stitch only about seven scarves per day. Two collections of silk scarves are released each year. There are now over 2,000 designs and they have been sported by leaders the world over. Princess Grace of Monaco used one as a sling for her broken arm in 1956. Emily Blunt's character set boxes and boxes of Hermes scarves flying into the air when she was hit by a taxi in The Devil Wears Prada. 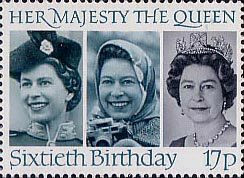 Queen Elizabeth is frequently photographed with a Hermes scarf covering her head (and a postage stamp featuring her wearing one of the famous scarves came out in the 1980's). We are excited to have an array of Hermes Jumping boots available to buy at an unusually great price. 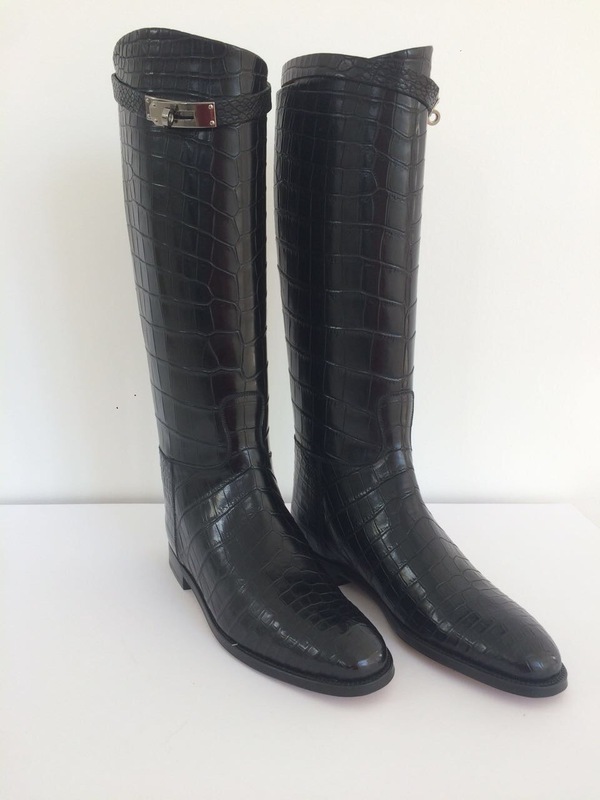 We have black crocodile, and several colours in calf leather. They are hand stitched and feature the Kelly metal strap design. Please email us at contact@lilacblue.com for size and colour availability. Copyright Â© 2017 Lilac Blue London, All rights reserved. It's back to school month, and everyone has finally settled into work mode....London is slowly taking on its shades of autumn, with heating going on, traffic building up in Mayfair, and the streets filling again with shoppers. Beware, the Uber taxi company has just been banned from London! With thousands of young commuters in London now left using public transport or expensive black taxis, look out for more designer backpacks as people walk to work....this is one of our favourites, a Blue Electric lambskin backpack from Chanel. Lilac Blue London's tip: pack a Hermes rain jacket......If you need one we always have spares available for clients! I've always thought of the UK fashion industry being led by quirky independent brands and the French by luxurious and established families, but sadly this image is wildly out of date. This week Michael Kors reached an agreement to buy British fashion house Jimmy Choo for £896m. Jimmy Choo had an extraordinary lead in the UK fashion market in the early 2000's. My wedding shoes were Jimmy Choo and while they were way beyond the shoe budget, the tottering gold heels and giant diamante were the talk of our celebrations. Sadly, Choo's position as the most luxurious UK shoe brand is no more, and its sale to Michael Kors is designed to allow the shoemaker to expand. For Michael Kors, it has finally been realised that the KR logo is just too present - the handbags are everywhere - and it is hoped that Jimmy Choo will add some much needed luxury to the Michael Kors brand. What we are sadly more likely to see however, is the Jimmy Choo luxury image being extended to sell more affordable items. We would like to see it creating imaginative and limited edition leather goods, which we believe would extend the kudos and lifetime of the brand....But we expect the brand to turn more mainstream, to appeal to short term investors and possibly endanger its longevity. At a time when serious fashionistas are looking for new small luxury brands and clever niche products this is a shame. Hermes is the one house that has not given in to short term financial gain, and continues to show a profit, with a Hermes scarf being sold every second somewhere in the world. The scarves are made in such short supply you are unlikely to ever see yours being worn by someone else. We have been looking into how they are made, and speaking to the craftsmen and women, and will share our heartwarming findings next month. The company has made very few limited edition handbag lines this year, so we are hugely excited about these new models. The crazy red and yellow creations have a playful angle: contrasting coloured piping on the edges of Birkins, and colour-blocking on Kellies. They are for the 2018 Resort Collection, due out in the Spring. 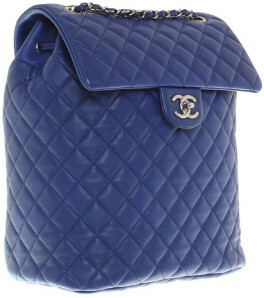 They are likely to be more expensive than the one-colour bags, and will initially be offered only to their best clients. We will of course get our hands on a few, so let us know if you'd like to be offered one of the first that comes out. 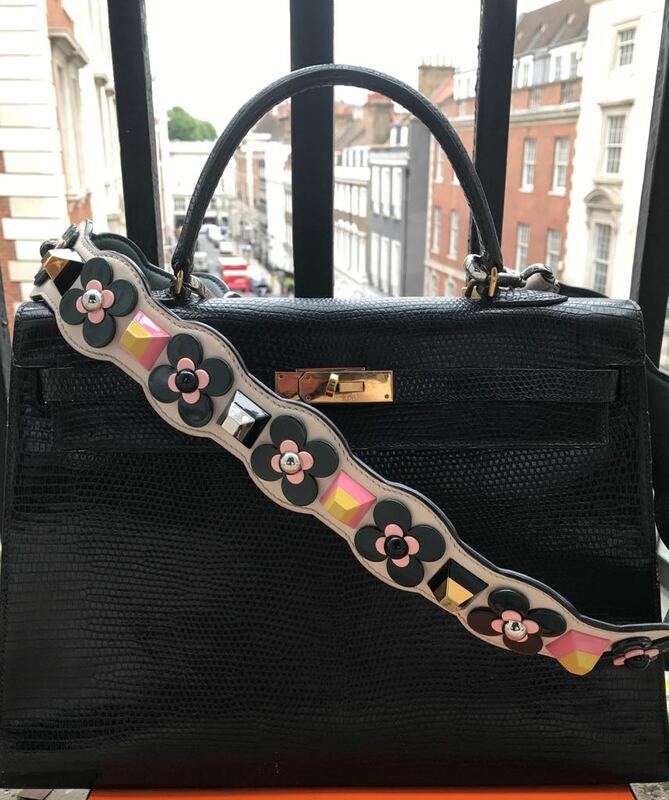 Our verdict on the design: we love the Birkin Edge, it's lighthearted and joyful, for sunny days and for ladies who already have the classic etoupe, black or orange. But beware, you may not want to wear this bag every day, so do not make it your first Birkin. Now look at the Kelly: the block design is an entirely different ballgame: while the bag offers eye-catching geometry, the colour combinations lack easy harmony and can be aesthetically challenging. Like a piece of modern art, you might need to spend time with it before you actually like it. What the creative team is emphasizing here is the casual nature of the Birkin, and the more conservative and sophisticated feel of the Kelly. So the Birkin Edge makes the wearer look carefree, happy and playful. Wear it to an upbeat lunch with girlfriends in Capri and to your ex-boyfriend's wedding. The Kelly Block will enhance your credibility in the boardroom, and at your mother-in-law's birthday party. What is for sure is that they will keep their value and carry an enormous premium at Christie's next year, if they can get their hands on one. Lilac Blue London is featured in this month's Vogue, with a listing for our vintage Hermes bags in the British Secret Address Book. So we thought it a good idea to mention one of our favourite vintage bags. This is a lizard 35cm Kelly, with a date stamp of E (it's over 20 years old). It was £15,000 but has been reduced to £12,000. Here it's been seen with one of our favourite Fendi straps. Man, how cool. Lizard bags are highly prized in Asia, but are not well known in Europe, and at Hermes they are rarely produced. The skin gets its shine from the small size of the scales. It is one of the most delicate skins, and can dry out if not looked after, but can also last for decades. This black lizard Kelly is 35cm which is unusually large for lizard, and one of the few remaining Kelly bags in this size. Click http://ow.ly/yG7l30flSFE for details. 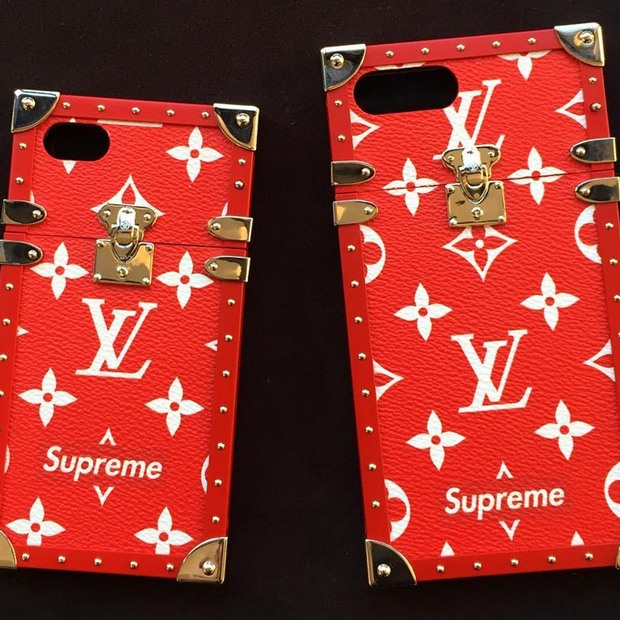 Louis Vuitton's collaboration with the skater brand Supreme was a raging success this summer, with the limited edition menswear collection selling out in a few days. 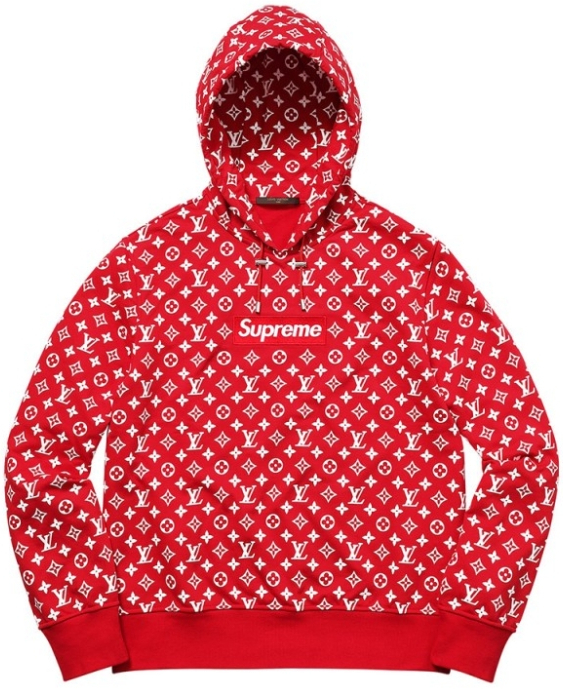 The brand Supreme is known for bold designs, and when a new one is unveiled, people have been camping in tents on the pavement outside its store in London's Soho district. The idea of one of Paris' most luxurious houses collaborating with an urban street brand is not new, but is always risky, and this one has worked really well, largely because the products are fun and bold, which works well with lovers of the Louis Vuitton style. We have a few pieces available, such as the phone cover and the hoodie. 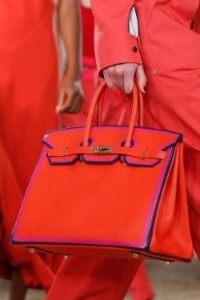 In the last 6 months we have seen very few classic coloured Birkin bags being released. 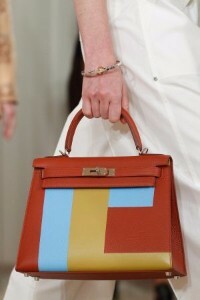 Hermes has increased production but only in new seasonal colours. As a result, the classic colours are in high demand. If you can get one, do so, as this manufacturing pattern is likely to continue. The most sought after bag this month: black Birkin 30 with gold hardware. If you can wait to get this bag, do so! It will be more affordable soon. Also, be aware of sizing: if you are looking for your first bag, you might want to go for the classic 35cm. The prices are attractive at the moment (and probably not for long), and big bags will be coming back into fashion soon. As we working women take on the world and get taller and stronger, the 35cm will be the long-term winner in Europe, the Americas, the Middle East and Africa. Europe is in full holiday mode this weekend, with flights, hotels and rental cars across the Mediterranean at full capacity. We are celebrating summer with a new lovely Hermes blue colour but first, some fabulously absurd news from Hermes Paris. The flagship boutique in the rue du Faubourg has introduced a new appointment policy, whereby if you get to the shop early enough, you can get an appointment with the Handbag Department and may be offered the opportunity to actually buy a bag. In effect, customers have to queue on the pavement outside the store to ensure they can get in. And as you will all agree, this is no way to start a day meandering around Paris. So the New York custom of line-sitting has taken off on Paris' smartest shopping street. Students and locals are happy to sit all night to secure the position for a few hundred euros, and then have to be escorted by Hermes security into the store as violence has erupted on more than one occasion, with queue jumping and the occasional physical fight! We even heard that last week the police had to be called to remove the line sitters. 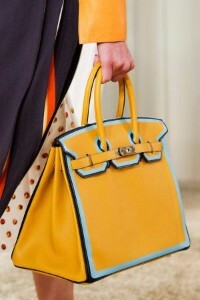 In a few recent years, Hermes has produced endless shades of one colour. Two years ago it was blue. We were drowning in blues, and although they are all lovely complicated shades, Lord you can have too much of a good thing. So this year we are pleased that there has only been the one this Spring, the beautiful Zanzibar. It's a mixture of bright blue with deeper hues of green. We have this new Birkin 35 winding its way to Vigo Street next week for viewing by our lovely customers. For more information click here http://ow.ly/PYsg30e1Ap8. From the dozens of watches we see every month, it is always hard to choose which one to offer you. This month we went for pink in a big way because we love it! This highly unusual Ballon Bleu is 33cm. It is pinker than any other model we have seen, number WSBB0002, which has been customised with .94 carats of VVS quality diamonds. It has a steel case and a pink dial made of sapphire crystal, on a pink alligator strap. It was purchased on 12 May 2017. As soon as we saw this, we HAD to offer it to you. I hope you'll agree. It's £9,900. And finally, do you like this view? If you are looking for a London property from £7m, we have access to a selection of new, amazing flats in an iconic Central London location. They will be sold privately. Please let us know if you'd like more information by emailing contact@lilacblue.com. Wishing you a wonderful summer, and so long for now, until our next News Flash! Summer is truly upon us this week and London shines with hope and summer spirit. Bright colours are back in fashion. Christie's Handbag and PR departments have been busy these last 2 weeks. Firstly a new world record was set in Hong Kong as a Himalaya Birkin with 10.23 carats of diamonds was sold for a record-breaking £293,000. A similar Himalaya Crocodile Diamond bag became the most expensive handbag when sold for £208,250 last year. In 2015, a pink crocodile-skin Hermes Birkin bag was sold for £146,000. In 2011, a gold-and-diamond Birkin, formerly owned by Elizabeth Taylor, sold at auction for £142,000. The fact that it belonged to Ms Taylor added serious value, this is by far the most expensive pre-loved handbag to ever be sold. Secondly, the first London handbag auction took place on Monday. I was concerned that with Ramadam upon us, Christie’s auction would be quiet. But there was a happy buzz around the room full of bidders from London, and two banks of staff lined the room taking calls from the UK, Hong Kong, New York and Australia. The Bleu Marine Crocodile Birkin with diamonds, unused, but from 2007, fetched a large £125,000 which - after the 30% premium and tax - has cost the bidder a very considerable £162,500. Our opinion: given that the bag is 10 years old, this is a little high. Back in what we can now call the more affordable Lilac Blue showroom, we have seen a new wave of interest in the Constance handbag. This has been sparked by the new funky ‘On a Summer Day’ Constance, an extremely modern route for Hermes in a collaboration with architect-come-artist Nigel Peak. The cubist design is inspired by a cityscape: showing buildings and trees in summer. We have such a bag, brand new in its box, and untouched by human hands, at £19,000. Please click on the image to see the details on the website. The extremely rare Calatrava Waterlilies (5077/100G-001) is in white gold with a diamond bezel. It comes with its box, papers, certificate and international warranty and is one of the timepieces from the Contemporary Collection. So long for now, until our next News Flash! Lilac Blue London has been showcasing extraordinary handbags in Vigo Street, Mayfair for more than 7 years now, and we thought it high time we began to share our expertise to keep our loyal clients abreast of the news, developments and exciting investment opportunities available in the uber luxurious global Handbag Market. So we are delighted to announce the start of a monthly News Flash which will contain some exciting features, including our favourite Bag of the Month, commentary on the cutting-edge trends in the luxury handbag space, hot tips on shrewd investments in new or vintage bags, and the occasional opportunity to purchase a highly desirable limited edition item which is NOT a handbag! Hermes' brand-new Sloane Street showroom, on the corner of Cadogan Place, delighted us with a great range of beautiful bags for sale in their opening week. Offerings included a diamond crocodile Birkin for those who have £158,000 burning a hole in their pocket, and Hermes used the opening to relaunch the "London Bag", originally seen in 1962, featuring quirky straps inspired by the shoulder epaulettes of London police. The shop spans two floors, is beautifully minimalist and as classically stylish as you would expect. Then tucked underneath the curvaceous staircase is a spanking new Yamaha motorbike, covered in Hermes leathers.It's a fabulous reminder of the made to measure leather services Hermes offers. Lilac Blue London usually recommends the purchase of tadelakt leather Hermes products only to very serious collectors: although it's the original Hermes saddle leather, and made from the most expensive calf leather, developing an amazing shine over time, it is subject to scratching. So when the first scratch is made, it can seem an almighty calamity! But rest assured, after a few marks, knocks and bumps, you realise that the bag's timeless charm comes from its shine and the imperfections that highlight that shine, like a fondly battered Chesterfield sofa. I have mentioned it here because never before have we seen a classic etoupe-coloured Birkin made in tadelakt leather. It's by special order and an arresting piece, and we have one in Vigo Street. Please click on the image to see the details on the website. Buy a piece you actually like. You may look at it regularly and you need to care for it, so make sure you are fond of it and it will help you preserve and increase its value. Make sure the bag is in excellent, or very good, condition. Serious tears or stains will hamper the bag's appreciation in value. And FINALLY, Lilac Blue London's promised non-handbag offering! Having concentrated on building the best collection of Hermes bag in Europe, we are now looking to diversify our luxury product offering and, on a highly selective basis, we are beginning to showcase some of the most desirable watches in the world. I trust you agree we have chosen well! We are offering a Patek Philippe 5711/1P 40th Anniversary watch, one of the most sought after and iconic watches in the World. This limited-edition model was launched in late 2016 to celebrate the 40th anniversary of the Nautilus; the original Nautilus was made in 1976 and was one of the most celebrated watch collections ever. The 5711/1P features a blue dial with diamond hour markers, the typical Nautilus embossed decor, and a discreet recessed anniversary logo. It is limited to only 700 pieces. This watch is brand new and comes complete with the 40th anniversary presentation box, papers that can be printed in your name and full Patek warranty. The watch has a retail price of approximately £90,000. Like the finest Hermes bags, it can be immediately purchased by the very lucky few at a premium price, even by those who are not VIP Patek Philippe clients. Please email contact@lilacblue.com for more information.